Ahead Of The Holiday Season, Toys R Us Files For Bankruptcy Protection : The Two-Way The largest U.S. toy chain filed for Chapter 11 bankruptcy protection late Monday. Toys R Us plans to use $3 billion in bankruptcy financing to buy merchandise from vendors and fund operations. 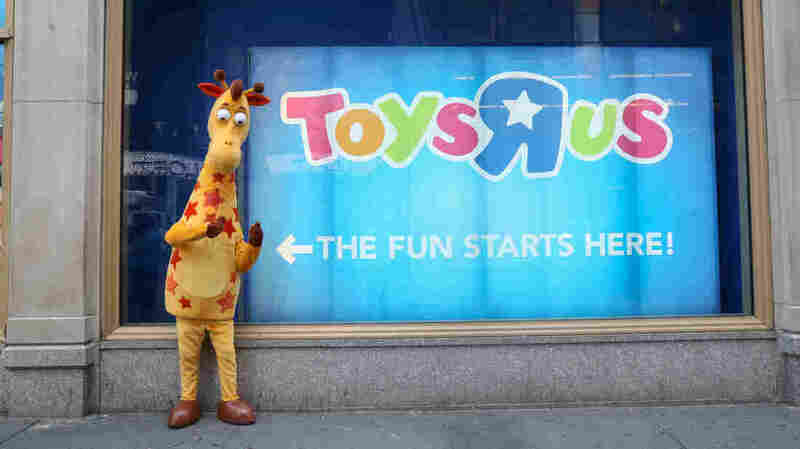 The Toys R Us Times Square Holiday Shop held its grand opening last month in New York City. The largest U.S. toy store chain filed for bankruptcy protection late Monday, but most stores are operating as usual. Toys R Us plans to use $3 billion in bankruptcy financing to buy merchandise from vendors and fund operations. The new financing is subject to court approval. As the holiday season draws near, Toys R Us wants customers to know that stores and its website will operate as usual. In a written statement, Chairman and Chief Executive Officer Dave Brandon said: "Today marks the dawn of a new era at Toys 'R' Us where we expect that the financial constraints that have held us back will be addressed in a lasting and effective way." "As the holiday season ramps up, our physical and web stores are open for business, and our team members around the world look forward to continuing to put huge smiles on children's faces." The Wall Street Journal reports that Toys R Us is a classic example of a "category killer," a huge specialty store with low prices that squeezed independent shops. "It swallowed up several rivals that have themselves filed for bankruptcy protection, including FAO Schwarz and Kay Bee Toys, a mall-based chain that liquidated hundreds of stores before it was sold. "They are the last major free-standing toy retailer in the U.S.," said Jim Silver, the chief executive of TTPM, a website that reviews thousands of toys each year for consumers. As the testing ground for new products, Toys 'R' Us often identifies hits before rivals, as it did with ZhuZhu pets in 2009, Mr. Silver said. "But like many other big-box chains, including Borders, Circuit City and Sports Authority, Toys 'R' Us struggled with the rise of discounters like Wal-Mart Stores Inc. and Target Corp. , and more recently, Amazon.com Inc. It was late to develop and expand its e-commerce business and placed big bets on licensed toys for 'Star Wars' and Lego movies that missed expectations." Retailers have been experiencing tough times lately, and experts say the industry's troubles are far from over. NPR's Yuki Noguchi recently reported on what a terrible year it has been so for for retailers. Consumers are spending, but more of that money is going to online retailers. Marshal Cohen, chief retail analyst for The NPD Group, told Yuki that brick-and-mortar stores aren't just competing with rivals. Their sales are also being cannibalized by their own online operations, where profit margins are thinner. "There is a lot of stress in being a retail worker today," Stuart Appelbaum, president of the Retail, Wholesale and Department Store Union, says. He told Yuki, "You worry about e-commerce, you worry about automation, you worry about what's happening with all the retail jobs that are being lost as stores close." Toys R Us is headquartered in Wayne, N.J. It operates about 1,600 stores around the world and has nearly 65,000 employees worldwide.